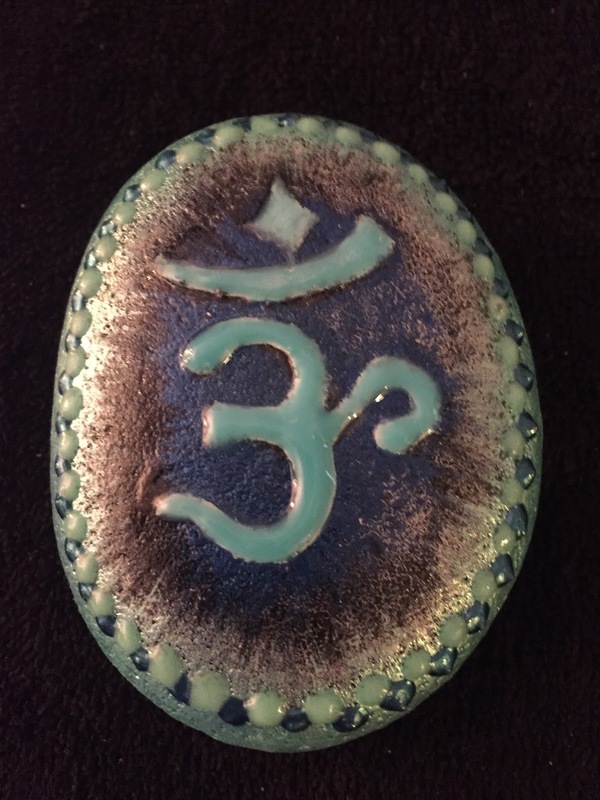 This weeks Rock is of a Hindu symbol for "OM" which is the universal sound and diving chant in the practice of Yoga. Although I am not a Yoga practitioner myself, I like the calligraphy of this image and wanted to paint it on a rock.It also can be viewed very nicely in the dark, which can imply serenity and peace.The image is seen a lot nowadays, because many Yoga studios have it posted as an iconic piece.It is no doubt that Yoga is having a positive effect on those who have begun practicing the morning "Asanas" or poses as they begin their day.I salute any form of physical or spiritual program that enhances the quality of one's life, and the lives of those around them. 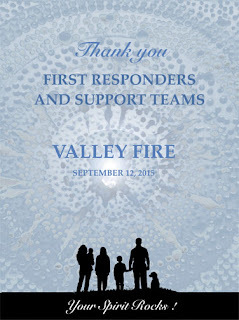 Today we have learned that the Valley Fire is 35% contained and that in spite of a much needed rain shower, the weekend is stacking up to be a hot one again.The evacuees are still camping out at the fairgrounds and the community has grown more organized by the hour.One must go on... without paying too much mind to what has occurred. The stages of grief are arrived at quickly or slowly depending on how much you have taken in. These volunteers who have given of themselves, are learning important lessons about community and organization.We are all in this together, and we'll ultimately see how this whole tragedy plays out. 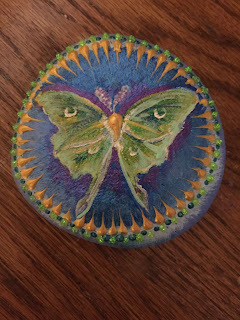 The rock I have to show this week is of a "Luna Moth". 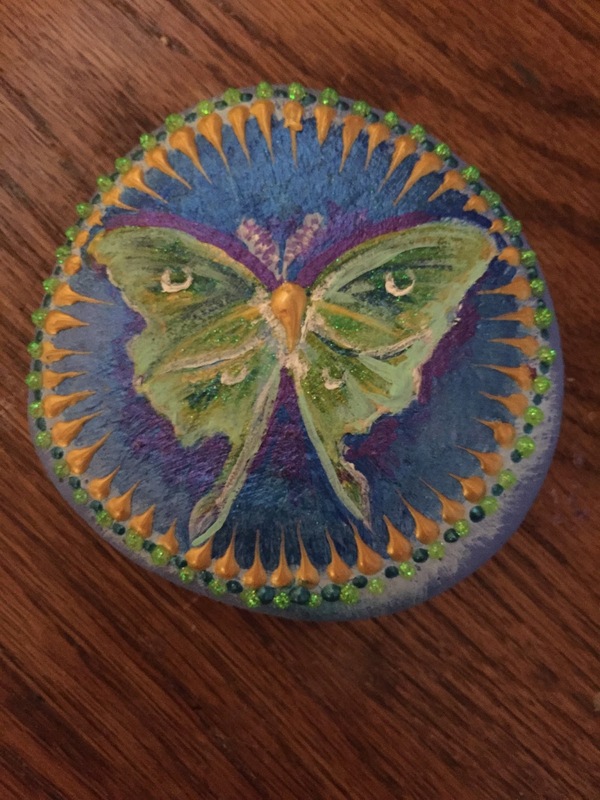 When I first saw this, it resembled some of the most beautiful Lepidoptera one would come across. My friend Ron said that I should look it up on Google and to see if it would be possible to recreate this image on a rock. (the top pic is the result). When I was a young man at Art school, it seemed that their were many ways to depict an object. One was through form, the other through structure, or even through color. We would know how to paint an apple it was assumed, by painting it either red or green.It would also in all likelihood, have a stem and be approximately three to four inches high. These considerations were not untrue, but only revealed part of a general idea of an apple.Apples can be a deep color of red with yellow highlights and specks of green. Apples can be short and squat, or large and round at the top. Well, as you might guess, Moths and butterflies have far reaching descriptions regarding their extensive variety of shapes, sizes and colors.This large moth for instance, showed up at the door to my apartment.This is not a luna moth, but another grandiose creature whose identity took me a while to locate. 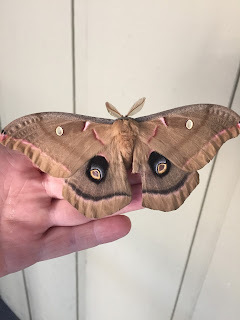 This creature was fascinating, and if my research is correct, it is a male polythemus (apparently the male have the plumed antennae).It is certainly not a Luna Moth, because the color is wrong, and although this one has a feathery 'plumose' it does not have the long tail or teal green color of a Luna.